Welcome back to Supergirl and welcome back to a brand new Supergirl status quo! Rather than pick up on the Ben Lockwood arrest storyline from the midseason finale, “Suspicious Minds” takes some unexpected swerves as it explores Kara’s newfound separation from the DEO. It’s a pretty weird outing, one that starts as an engaging alien mystery palate cleanser, only to pivot to something else entirely. For most of its runtime, “Suspicious Minds” centers on the mystery of the Morai—an invisible alien race with a dark past. Only it turns out the Morai are mostly just there to fill for time while the episode builds to its real climax: The reveal that Alex is going to have to mind wipe her knowledge of Kara’s Kryptonian heritage in order to protect her sister’s secret identity from the DEO. While an unexpected pivot can sometimes be a really compelling storytelling choice, here it just feels like a random one. One of the biggest problems is that the Morai are incredibly compelling on their own. A powerful alien race with the ability to turn invisible, they were captured by the U.S. government as children and forced to become assassins. It’s dark stuff, and Colonel Haley—who worked on the initial phase of the project—even notes that the government specifically used trauma as a way to force the Morai to obey. Once the government decided to cut ties with aliens, however, the Morai were deemed collateral damage and set to be executed. Only they managed to break free and set out on a vengeance mission against the government agents who first enslaved them. It’s an incredibly grim story, one with a huge amount of potential for the show to dig into the horrors of the government’s treatment of the Morai and to tie that into this season’s larger exploration of alien oppression. (The Morai seem to have been enslaved for decades, right?) In the end, however, they’re mostly just there to provide a few Predator-inspired action beats. Director Rachel Talalay succeeds at creating some compelling action sequences despite clear budget limitations. But it’s strange that this episode introduces the Morai as this big ethical dilemma and then just loses interest in them. Despite a pretty shocking moment where one of the creatures kills itself rather than be taken into custody, the episode doesn’t even really resolve their storyline in any kind of meaningful way. Most of them seem to get killed, except for the one Kara manages to imprison when she swoops into the DEO to save the day. Given the way Haley operates, however, I can’t imagine that Morai is long for this world either. Meanwhile, the “Haley tries to learn Supergirl’s secret identity” subplot unfolds along its own strangely convoluted path. Though she apparently has a truth-seeking/mind-reading alien creature at her disposal, for some reason Haley doesn’t call upon that resource right away. Instead she goes through normal interrogations, successfully discovers Supergirl’s identity, has her mind wiped by J’onn, and then pulls out the alien deus ex machina. It’s an unnecessarily messy arc the show could’ve easily streamlined by having the truth-seeker be a looming threat from the beginning. That also would’ve given the episode a chance to build up to all the mind wiping business, rather than just tossing it all in at the end. Still, if there’s an upside to this episode’s weird final swerve, it’s that it allows Melissa Benoist to turn in an absolutely heartwrenching performance as Kara breaks down at the thought of cutting Alex out of such a huge part of her life. The preview for next week’s episode seems to imply that things pretty quickly go wrong for the mind-wiped Alex, which isn’t really all that surprising. Kara’s been such a huge part of Alex’s life since she was kid that the idea that Alex could wipe away such major memories (while somehow still remembering that Kara is her sister?) seems incredibly dubious. Alex argues that she has to wipe her memories because that’s the only way she can keep her job at the DEO and keep fighting to make it a better place. But given how much of Alex’s identity and morality has been shaped by her relationship with Kara and Kara’s abilities, is there even a guarantee that she’ll still be a good person without half her memories? 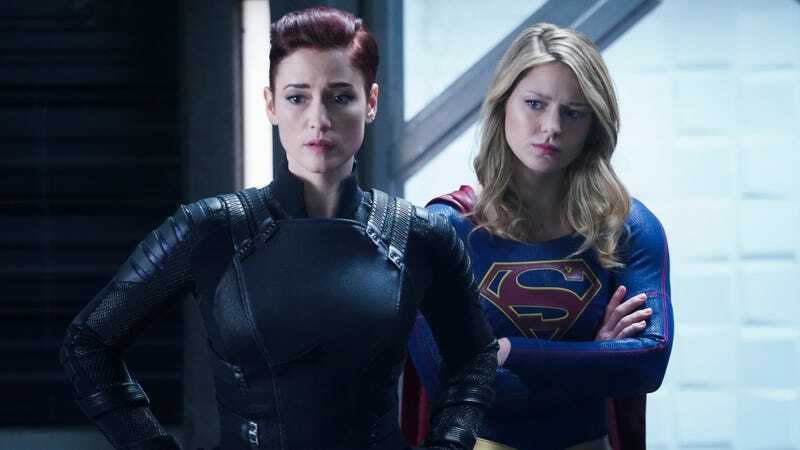 That’s for the next episode to parse, however, and, on principle, I’m excited about any storyline that puts the Danvers sisters’ relationship front and center again. It seems like there’s a pretty high margin of error for this memory loss arc, but hopefully after clearing away the hiatus cobwebs, Supergirl will find a little more structural confidence next week. “Red Daughter” (a.k.a. Soviet Supergirl) has upped her training sessions and abilities. Her handlers also reference “our friend” and his ability to control her. That has to be Lex Luthor, right? Brainy and Nia go on an adorably failed date/meeting during which he encourages her to embrace her role as a superhero. He even has codename and costume ideas! Also, Brainy opens up about having been on a dark path before being arrested and given the opportunity to change and become a hero. I think that’s all new information, right? James and Lena patch up their relationhip after he apologizes for criticizing her behind-the-scenes manipulations, and she opens up to him about her attempts to give powers to humans. Let the countdown to James getting superpowers begin! That five agents at the DEO know Supergirl’s secret identity feels like a pretty massive thing for the show to just offhandedly reveal. I’d previously considered Haley to be a morally grey character, but between cruelly justifying the Morai enslavement and planning to coerce Kara into DEO servitude, this episode seems to move her into full-on villain territory.